When Earth Day dawned in 1970, optimistic environmentalists predicted emerging technologies would help reduce the nation's reliance on coal, oil, insecticides and other pollutants. But 35 years later, a big part of the problem appears to be technology itself. Tons of computers, monitors, televisions and other electronic gizmos that contain hazardous chemicals, or "e-waste," may be poisoning people and ground water. Activists say the nation's biggest environmental problem may be the smallest devices, and this week they're launching campaigns to increase awareness about recycling cell phones, music players, handheld gaming consoles and other electronics. President Bush has marked Earth Day by urging Congress to pass his controversial clean air program. Bush's "Clear Skies" plan would set limits for nitrogen oxides, sulfur dioxide and mercury from power plant smokestacks. But businesses could trade pollution credits. Environmentalists say the plan actually weakens existing rules, and it's currently stalled in the Senate. Mr. Bush had planned use his visit to the environmentally-sensitive Great Smoky Mountains to promote his environmental and energy agenda and spend a few minutes helping volunteers restore a nature trail, but the outing was canceled because of thunderstorms and occasional high winds, reports CBS News White House Correspondent Mark Knoller. House Democratic leader Nancy Pelosi of California issued a statement challenging the Bush administration record. "Since the first Earth Day 35 years ago, our nation has made great strides toward cleaning up our air and water. Unfortunately, it has taken the Bush Administration less than five years to undue many of those efforts and undermine our major environmental laws." Chicago's Brookfield Zoo was having an Earth Day gala Friday and Saturday that will include an environmental fair and a tree-planting ceremony. Also Saturday, Chicago launches its first permanent battery-recycling program with drop-off sites at all Chicago Public Library branches and Walgreen stores in the city. After a campaign that resulted in significant improvements to the recycling program of Dell Inc., many e-waste activists are focusing on Apple. Environmentalists planned a news conference Thursday near Apple's Cupertino headquarters to coincide with the company's annual shareholder meeting. California officials were marking Earth Day by promoting an effort to equip businesses with everything they need to start recycling. The department began testing the program a year ago at the Gold's Gym in Venice, the Hard Rock Cafe and Gap's San Francisco headquarters. Frequently, smaller portable gadgets have batteries that are prohibitively expensive to replace. So consumers in affluent countries simply toss them in the trash. "They're small and lightweight, and the electronics industry markets (sees) them as disposable. Whenever you upgrade your (wireless) service, you can get a new flip phone for $50 and they never tell you to recycle the old one," said Kimberlee Dinn, campaign director for Washington, D.C.-based EARTHWORKS, a nonprofit that studies the environmental impact of mining, digging and drilling natural resources. Environmentalists are particularly bothered by the recycling and reuse policies of cell phone manufacturers and distributors, and of Apple Computer Inc., maker of the iPod digital music player. The biggest offenders are cell phones, said Dinn, because they pose a hazardous "double whammy" to the environment. To build them, gold and other metals must be extracted from mines in western states, as well as Peru, Turkey, Tanzania and other countries. The Environmental Protection Agency ranks hard-rock mining as the nation's leading toxic polluter. Then, at the end of their life cycles, many phones end up in landfills, where they may leak lead and other heavy metals that could pollute nearby ground water. Americans have about 500 million obsolete, broken or otherwise unused cell phones, and about 130 million more are added each year — the equivalent of 65,000 tons of waste, according to the EPA. Less than 2 percent are recycled — usually refurbished and resold to consumers in Latin America and Asia, or disassembled for gold and other parts, according to EARTHWORKS. It's unclear what happens to the remainder, said Dinn, whose organization is launching a recycling campaign to coincide with Earth Day on Friday. Activists are asking consumers to download and print postage-paid labels and send unused phones to the Atlanta-based recycling organization CollectiveGood. The goal is to collect at least 1 million cell phones this year. "We think a majority of those phones are waiting around in people's desk drawers," said Dinn, who came up with 30 unused cell phones in a recent sweep of the group's eight-person office. Environmentalists are encouraged by legislation passed by the European Union, which, starting in July 2006, will prohibit new cell phones sold in any EU country from containing lead and several other toxins. 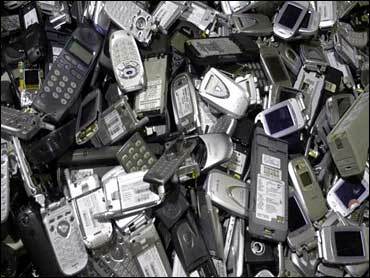 Also in July 2006, California will require all cell phone retailers to have an in-store recycling program. But cell phone initiatives may not be enough to stem overall e-waste. U.S. consumers retire or replace roughly 133,000 personal computers per day, according to research firm Gartner Inc. According to a study commissioned by San Jose-based Silicon Valley Toxics Coalition, roughly half of all U.S. households have working but unused consumer electronics products. CEO Steve Jobs and Apple board members, including former Vice President Al Gore, have each received at least 400 faxes about the company's contribution to e-waste, said Robin Schneider, executive director of the Texas Campaign for the Environment. The group is asking Apple to reduce or eliminate recycling fees for consumers and build in-store recycling centers. Apple charges most American consumers $30 to recycle unused or broken computers and laptops. And though Apple doesn't have a specific iPod recycling program, a service promoted by its corporate Web site sells consumers shipping labels and packaging materials for sending equipment to recycling vendors.